Life has a funny way of kicking you in the gentleman's region sometimes. I mean yeah, I thought I found love earlier this year only to be told "I'm not attracted to you". You find some cool people to hang out with that enjoys the same things you do and then boom! They all move away, not really far either. It starts with a "Oh, we'll TOTALLY hang out like we used to" to those awkward IMs you get at 1 AM, to perhaps a like on Facebook, to...well, nothing. Perhaps you found a new show that really excites you, until that one episode happens that turns you into an emotional wreck. I'm going to talk about the latter. I have had Netflix for a while now and have experienced movies and shows I would have otherwise never have seen. Some are good, like Reaper, some are bad, like The IT Crowd. Some just hits you in the right spot. I found that in a little known show you probably never heard of called Adventure Time. I gave it the "Three Episode" clause, and it only took 5 minutes for me to be hooked. I don't have cable or satelite, so I do not get Cartoon Network, so I was eagerly awaiting the season 2 release. When I got it, I became more invested in the show, and considering that it is 5 seasons and counting, I had some catching up to do. Thankfully, each season is 26 episodes long, but each episode is only 11 minutes long, so it did not take long to catch up. However, I finished much later then I should have because I had to stop watching it after I saw some certain episodes. Maybe someday I'll do a more full blown review of the series and characters, but by far my absolute favorite character in the series has to be the Ice King. At first it was because he was incredibly quotable and a silly villain which made me reminisce about the days of the Disney Afternoon shows and seeing villains like The Beagle Boys or Megavolt. If he appeared in an episode, even just as a cameo, it instantly made the episode better for me. Then I realized something else about his character, in that he seemed relatable on some level. The came an episode called Holly Jolly Secrets where Finn and Jake steal some of the Ice King's private video diaries. I was hoping they would feel some sympathy for his character, but sadly they didn't seem to care, until they got to the final video. [Spoiler (click to open)]The video is of Simon Petrikov who finds a mysterious crown which is just like the one the Ice King wears. The video cuts forward through time as Simon is slowly transformed into the Ice King and that is when we find out that the Ice King actually used to be human. This actually explains why he seemed more human than the other creatures in the land of Ooo. The reason he longs for marrying a princess stems from him losing his fiance due to the crown corrupting his mind, later calling her a princess. He doesn't seem to acknowledge his past as much as someone with a stable mind would. With a picture of my awesome gun-show? I'm also working on my pecs! If you like, I'll send ya a picture of that, too. I'm so alone! Won't somebody tell me what's wrong with me!? 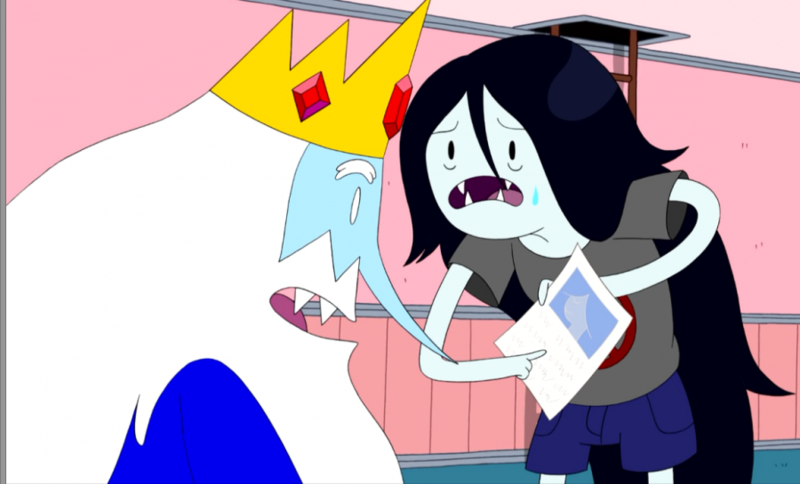 As this happens he starts using his ice powers all over the place in grief and pushes Marceline away. He hides in the kitchen while she admits that she actually liked seeing him. He then asks her if she wants a hug and she gives him a long-awaited one. Of course he misinterprets this as a romantic gesture, but she shuts that down right away. I was ecstatic that someone actually tolerated his presence. He really deserved it after all the stuff he goes through in that show. Then Marceline sees more clippings from his past and tries to remind him of who he used to be. He reads the pages, he knows he wrote them, but he simply does not remember a thing about his past or the things that took place, like taking care of a younger Marceline. She breaks into tears trying to make him remember but it just doesn't happen. I'll admit. I was tearing up as well. There is one more episode with the two of them as of the time of this writing, but aside from a sad Cheers reference, there isn't much to say other than that at one time, the Ice King was a really stand up guy. For me, I got hit with a double whammy from that episode. 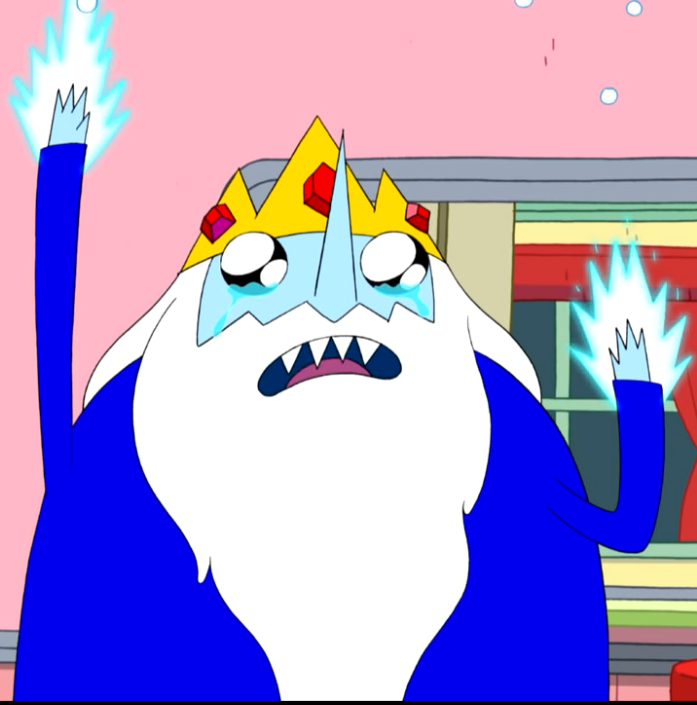 First, I'll take the narcissistic path and just say that I completely relate to the Ice King. Throughout the series, yes, he has done bad things, but at his core he just simply want to have friends and companions in his life. The only time he has someone, other than Gunter, it is either because they are trying to save someone he stole or they want something from him. He doesn't really have friends or romance to speak of, though he longs for it, and when he searches for it, he gets short changed. True, a couple of times he did find something and took it for granted, but there is a universal truth to his character that I believe all people need. Friendship. I'm not trying to get all preachy or after-school special on you, but seriously, everyone deserves a friend. I grew up with some really great friends and the streams of time or circumstance has made everyone go away. I find myself staring at a computer screen each night, wondering if I can find someone who gets me. I know I bellyache on here all the time about finding that special woman to complete my life, and that hasn't changed, but at this stage of my life, I would settle for just someone who can tolerate my company for more than an hour. 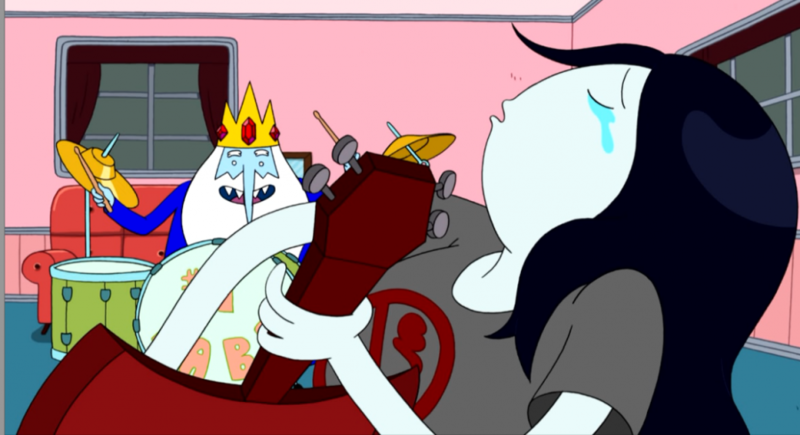 Just like in Ice King's song, I spend nights asking Grod why I can't figure out what's wrong with me. Why am I so repulsive to the friendship paradigm? What's wrong with me? Why doesn't anyone reach out to me? Why is having a conversation with me or just me asking to hang out a joke to others? How much longer do I have to go through this? 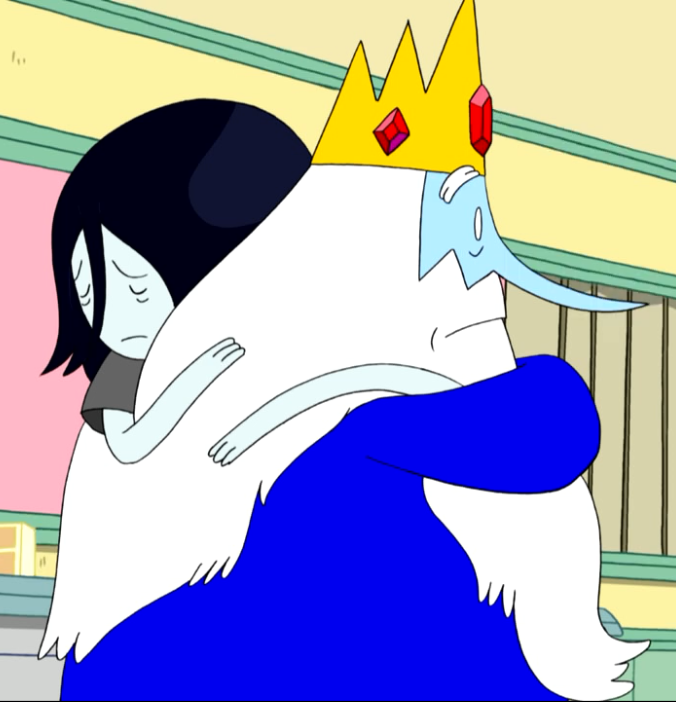 So the reason I can relate to the Ice King's sadness is because I experience that sometimes. The things he says, the questions he asks, the sadness he feels, I have felt. People smiling, talking about families and relationships, I can't relate to that. Loneliness? I can relate to that all too well. The second thing that got to me was Marceline desperately trying to get him to remember his past. Tears started forming in her eyes as she begins to realize that the person she used to know is gone, lost to insanity and the fog of memories. It has been a while and I'm not sure I admitted this on here, but a few years ago my father was diagnosed with the early stages of Alzheimer's, something that has evidently ran in his family and can very well be the fate that is in store for me if I make it to old age. There is also a lady that went to my church that lost her husband several years ago. Soon after her mental state took a turn for the worse to the point she had to be taken to a nursing home. A man who has known her for many years went often to visit her but after a short while, even though he had been there just days before, she did not even know who he was anymore. I know that eventually the same thing is going to happen to my father. It hurts to know that in the end he may not remember who his children are, who he married, or things of his past. There have been plenty of signs already, and each one is heartbreaking to watch. I'm sure many of you know that this ailment is not curable. There is no magical cure for when someone is diagnosed with this. The best you can do is keep your mind active, do activities, and with a little medication, you may be able to slow down the deterioration of your mental faculties, but all it does is slow it down. You can't stop the inevitable from happening, just like many other diseases in the world. I've seen my father look at pictures of things we did years ago as a family, like going to the fair, or going to Silver Dollar City, a local theme park, and he simply doesn't remember them very much. I've done medical research and I know he has just a few years left. Precious time to be with him. Sure, the Ice King isn't suffering from that exactly, but the symptoms are essentially the same, it is just that the insane Ice Wizard has taken over his being while his old life is all but vanished save for some memories from Marceline and scraps of his journals he wrote in. I'm not going to take this journal down. It is about the only place I can vent, in hopes that someone will read it, and realize that there may be reasons why someone is sad, or doesn't know how to express true happiness. People are convinced that someday I'm going to show up and be in a fantastic mood, smiling and just being all happy, sunshine, rainbows, and unicorns pooping cotton candy. The best I can ever muster and be completely genuine is simple indifference. The truth is I don't know if I'll ever experience that again. Somedays it seems like the chances of me finding a true friendship or companionship are about the same as soccer (football to nearly any other country out there) becoming the most popular sport in America. It seems distant, almost possible, but almost impossible to obtain. Perhaps I'm just a cautionary tale for others and that is my lot in life. To be an example of how not to end up in your personal life. If your worth is determined by the number of friends and relationships you have, I'd be the one that is looked down on by hobos. Virtually and perpetually bankrupt. So yeah, that is why a Children's cartoon show hit me hard. I Remember You is probably the most popular episode so far of this series because of the sheer emotion and backstory the characters have. So many people wrote how it got to them, and it is easy to see why. It reminded me so much of two things, my social worth, and the inevitable mental loss of a loved one. When is the last time, if ever, has anything in media affected you that much?